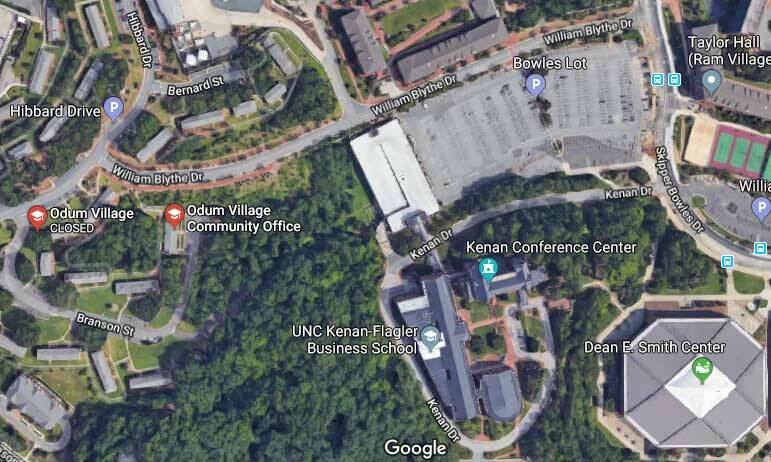 The proposed home for Silent Sam would be located in the Odum Village area, about a mile from the Dean Dome. The UNC-Chapel Hill Board of Trustees unveiled its plan for the Silent Sam Confederate monument Monday: a new, $5.3 million University History and Education Center. The proposed center, which would be used to showcase UNC artifacts and teach the history of the university, would be located in the Odum Village area. The area, one of 20 considered, is more remote than the monument’s historical site at McCorkle place. Once home to campus family housing, the buildings there are scheduled for demolition as the campus expands. The trustees would have preferred to move the monument off campus entirely, UNC Chancellor Carol Folt said at a special meeting of the board Monday morning. Large scale protests like the one at which the statue was toppled in August make it clear it is impossible to return the statue to its original place at the center of campus life. “Public safety alone would make it impossible to return it to McCorkle place or any outdoor site,” Folt said. The trustees were given until Monday to submit a plan for the fate of the monument to the UNC Board of Governors, who would ultimately have to approve the plan. Board of Governors, who will meet next week. State lawmakers may also get involved if they are not satisfied with the solution. Board of Governors members Phil Beyers and Bob Rucho attended Monday’s UNC Board of Trustees meeting Monday but neither would comment directly on the proposal. The confederate statue was toppled in an August protest on campus. The Confederate monument has been a point of tension on the Board of Governors for more than a year. When the movement to remove it gained national attention last year, the issue became a major flashpoint between UNC President Margaret Spellings and the increasingly conservative Board of Governors, which is appointed by the GOP-dominated General Assembly. In October, Spellings announced she would step down from her position after just three years, much of it spent at odds with the board. Some of the board’s most vocal members have demanded it be reinstalled in its original place, suggesting anything less would be caving to a violent mob of protesters who violated the law in toppling it. Folt called the new center a solution that preserves the monument and the history it represents while working within the law. The building, which would open by 2022 under the plan, would have state of the art security and offer the opportunity to more fully showcase and contextualize the university’s history. She hopes the Board of Governors will see it that way, she said Monday—not least because they will need to allocate the $5.3 million for construction and $800,000 a year in operating expenses. Where that money will come from isn’t yet clear, Folt said, but she is confident it can be found. While the Board of Trustees overwhelmingly approved the plan after an hour-long closed session, two members voted “no”: Allie Ray McMullen and Savannah Putnam. Putnam, who serves as UNC-Chapel Hill Student Body President, said she could not support returning the statue to a campus on which it no longer has any place. “I simply can’t support putting a Confederate monument back on campus,” Putnam said. 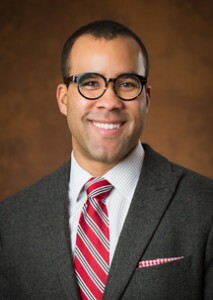 William Keyes, the only Black member of the Board of Trustees, voted to approve the plan. But only, he said, because the charge from the Board of Governors to preserve the statue and the law that prompted it are too narrow and do not take into account moral and ethical issues. The monument was erected in 1913 as part of a wave of racist sentiment wherein white supremacists were re-asserting their dominance, Keyes said. The stated objective of the monument was to honor students who lost their lives fighting for the Confederacy during the Civil War, Keyes said. The monument is a reminder that Black people were owned by white people and that people were willing to fight to preserve that brutal system, Keyes said. Keyes, a conservative who has been criticized for working as a political operative for the white minority government of South Africa during apartheid, said he has been polling Black students on campus as to whether they think this solution would work. Many have told him it may be the best possible solution under the circumstances, Keyes said, but he felt compelled to reiterate the shameful historical context of the statue even as the trustees seek to preserve it. A protest against the recommendation by students and community members was announced within minutes of its approval. Student and faculty sentiment against the plan was fierce online throughout the day. William Sturkey, an assistant professor in UNC’s History Department, said he found the plan’s $5.3 million and $800,000 a year in operating costs objectionable as many buildings on campus are badly in need of repair and departments are told they cannot make new hires—including someone to teach the History of American Slavery. Sturkey said he’s also skeptical that the new center will actually be an attempt to reflect UNC’s history accurately. The relative lack of Black representation on the Board of Governors, Board of Trustees and even UNC’s own Historical Task Force is a real problem, Sturkey said. The increasingly political nature of how decisions are made on the board is also troubling. 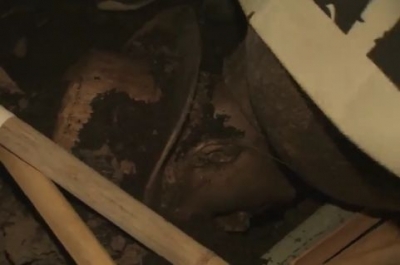 “One of the concerns about such a museum will be whether the University of North Carolina Board of Trustees or the statewide Board of Governors tries to impose their own political agendas over exhibits and content by limiting the academic freedom or freedom of speech of nationally-renowned experts on our campus,” Sturkey said. Sturkey also pointed out that before the statue was toppled, the position of the UNC administration was that the law prevented it from being removed from McCorkle place, even to be sure it was preserved. Now that it has been toppled, he said, they are arguing that no outside site is safe, no existing UNC site can make it safe, and that a new building must be erected for the purpose. In October the Faculty Council passed a resolution opposing the monument’s return to campus. Given the overwhelming negative feedback to the statue’s return to campus from the campus community itself, many said the decision is obviously being driven by the Board of Governors and Raleigh rather than the Chapel Hill campus.